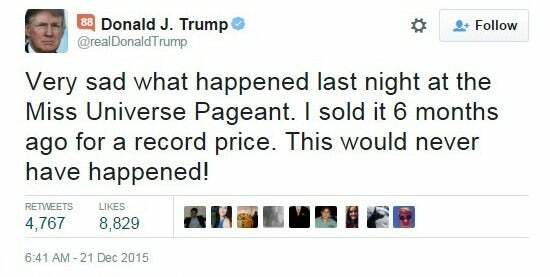 I have to admit, I had no idea the 2015 Miss Universe pageant was taking place this past Sunday. I found out about the contest when video replays hit the Internet. The big story was host Steve Harvey mistakenly naming Miss Colombia as Miss Universe, instead of the real winner, Miss Philippines. The news and videos went viral as we watched Miss Colombia being crowned and receiving the adulation of the crowd. She stood there for what seemed like minutes until Steve Harvey appeared to apologize and announced he had made a terrible mistake. The most awkward moment came when they removed the crown from Miss Columbia and placed it on Miss Philippines. Ouch. The Internet buzzed with comments and memes making fun of Harvey. The elimination card seemed easy to read, so it was hard to imagine making such a mistake. Harvey himself took to Twitter to apologize. There was plenty of sympathy for both finalists. My personal Facebook had dozens of posts about them and Steve Harvey. Soon national TV and media had the story all over. 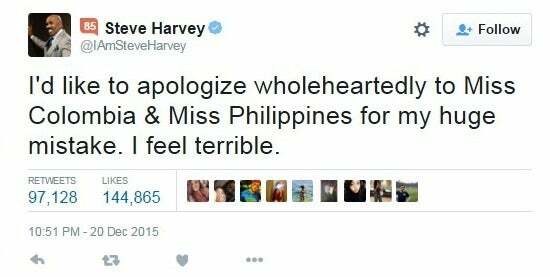 #MissUniverse2015, #SteveHarvey, and #SteveHarveyWinners became trending topics on Twitter. And, if that wasn’t enough attention, Donald Trump quickly weighed in on Twitter too. This was the biggest embarrassment in the history of the Miss Universe pageant. This was as bad as it gets. According to Entertainment Weekly, Fox’s telecast of the Miss Universe Pageant had 6.2 million viewers and a 1.7 rating among adults 18-49. That’s down 15 percent in that demo and down 18 percent in viewers from last year. A business is in trouble when it loses Donald Trump as its promoter, has been in steady decline for years and is down 18 percent year-to-year -- unless you bring in Steve Harvey to rescue the event with his (intentional?) blunder. I decided to conduct my own, non-scientific poll on Twitter, about people’s awareness of Sunday night’s pageant. I asked whether people had watched the event or only heard about it afterwards. Of the 1,500+ respondents, 28 percent said they saw it live and 45 percent only knew about the pageant after they saw a video replay. That means twice as many people saw the winner being crowned afterwards. If we translate that into actual viewers, it means Steve Harvey’s misread got the Miss Universe pageant an additional 12 million viewers! This is the kind of mistake a PR firm dreams of. It’s the kind of mistake, when planned perfectly, that can triple your audience. It might be the kind of mistake that stops the decline of the Miss Universe pageant’s viewership. Only time will tell. Was it an intentional mistake? Steve Harvey knows for sure. And just maybe, so does the PR firm of the Miss Universe pageant.